'Even when opportunity knocks, a man still has to get up off his seat and answer the door' - Anonymous. One local doctor, by grasping random overlapping educational opportunities, has become the catalyst for 'Doctors without Borders' (MSF) wanting to adopt the South African Triage Scale (SATS) as its standard emergency protocol for resource-poor countries world-wide. MSF volunteer and Stellenbosch University-trained Dr Mohammed Dalwai tested out the highly flexible and simpleto-use SATS in an emergency room at Timugara Hospital in Pakistan's volatile Khyber Pakhtunkhwa province - emerging with a 96% correct triage rate. This so impressed his MSF principals that they've since piloted it in Afghanistan and will shortly be trialing it in several African countries, making MSF the first international medical humanitarian organisation to consider SATS roll-out in multiple, lowresource, high-burden countries. The nursefriendly scale, developed in the Cape Town Metropole, halved mortality at the GF Jooste Hospital's hard-pressed emergency unit (which serves the trauma-ridden Cape Flats) when first tested in 2006.1 It was subsequently introduced as the official triage tool in public sector emergency pre- and in-hospital services across the Western Cape, yet ironically has yet to be officially adopted in the eight other local provinces (random hospitals in both the public and private sector in Gauteng, KwaZulu-Natal, the Eastern Cape and North West, use it on their own initiative). Dr Michèle Twomey, Triage Implementation Officer for the Western Cape (whose PhD degree was on the performance characteristics of the SATS), says its greatest utility is 'in any context where demand exceeds available capacity; wherever you find an overcrowded waiting room and not enough staff, and need a tool to prioritise patients based on acuity'. She said this accurately describes the 'daily situation' in emergency rooms across South Africa, particularly in more rural provinces. She's mystified as to why the national department of health (which sets national norms and standards) has yet to 'get up off its seat'.2 Twomey speculates that this has something to do with the bureaucratic following of the World Health Organization (WHO)-recommended, ETAT (Emergency Triage Assessement and Treatment) protocols for middle-income countries. Standardising the triage process with an objective component as is evident in the SATS requires accurate readings of physiology which may be perceived to be challenging in the social environment we're dealing with in our emergency facilities. 'The updated SATS includes elements of ETAT but takes it to the next level,' she explained. When quizzed, Dr Charles Theu, National Director of Emergency Medicine Services, said he would be sitting down with Dr Thabo Lekalakala, his counterpart in Hospital Management and Planning, early this year to discuss triage uniformity across provinces, in particular SATS. Asked why this had taken so long (given the opportunities presented by EMS preparations for the World Cup), Dr Theu said he had 'only been around operationally since the World Cup'. 'Even with the World Cup people were doing different things. 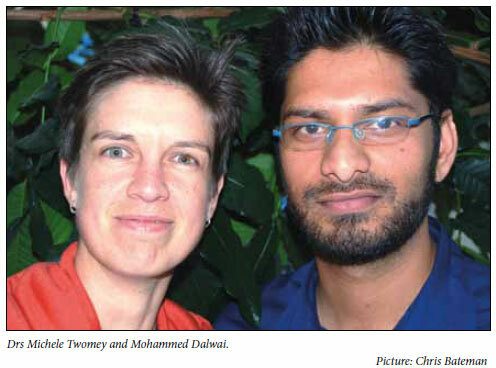 I've spoken to Dr Twomey and told her we're very interested. We need continuity of care and to prioritise correctly if we are to save more lives,' he said. 'To me SATS is excellent. Why re-invent the wheel when the wheel is turning? We need to get pre- and in-hospital on the same page and standardise the different triage systems being used across provinces,' he added. Dr Lekalakala said SATS was used in the pre-NHI quality assurance standards process for hospitals, 'which is why you find it being used randomly in other provinces'. He said however that without a policy directive from his superiors, 'there's no way we can get it done - Charles should lead that and MinMEC (the regular get-together of the national health minister Dr Aaron Motsoaledi and his provincial counterparts) would be the vehicle'. Theu's predecessor, Dr Peter Fuhri, now National Director of Disaster Medicine, said a policy document creating more provincial cohesion in his directorate was already underway. 'I cannot dispute Dr Twomey's findings - we should be using SATS'. Unique among triaging tools world-wide, the SATS includes clinical discriminators and an age-appropriate composite score - the popular Triage Early Warning Score (TEWS), and as a whole 'is more elegant and accurate'. It gives differential weightings to various physiological parameters and has the ability to predict acuity, in conjunction with clinical discriminators. The composite TEWS sets SATS apart from its peers which rely for the most part on physiological parameters in isolation only. Twomey says the composite score of SATS provides an 'invaluable safety net' and has been proven to be highly sensitive in picking up emergency cases. Which is why MSF volunteer Dr Dalwai, having continuously 'got up off his seat' to answer the door when opportunity knocked, was exactly the right person to change doctor/nurse behaviour at the remote Timugara Hospital emergency room near the war-torn Pakistan/ Afghanistan border. Dalwai said there had never been a triage programme at Timugara Hospital; triage was subjective, based mostly on a quick glance at patients by overworked doctors. His fortuitous saving of a young woman's life there convinced him that his SATS knowledge needed urgent application. The woman had been subjectively triaged as 'stable', given the 'usual cocktail' of drugs and put in a corner of an observation 'ward' where 20 women with attendant families shared five beds and a scattering of chairs. Patient pressure meant the local admitting doctor was unable to carry out regular checks and Dalwai found the woman 'cold, clammy and clinically in shock - she didn't look good'. Further examination revealed a ruptured ectopic pregnancy. 'This was a common scenario. When patients died nobody would question why or how,' he added. After convincing MSF headquarters to allow him to trial the SATS, he had to overcome three major barriers: reworking the flow of patients, cultural acceptance (devoutly Muslim country which limits the presence of men around women patients) and language. The emergency room was rebuilt, he convinced one English-speaking Pakistani doctor of the value of the SATS and this doctor then trained his colleagues and nurses in the local Pashtu language. Dalwai was unable to say how much they reduced mortality because no death certificates were kept, 'but I can say that we never found another girl busy dying in the ward again and none of the patients in the observation ward became critically ill'. He said the average emergency room in a district level hospital in Pakistan saw some 3 000 - 5 000 patients per month with the profile of trauma including road accidents, 'kids falling off mountains', bomb blasts, suicide attacks and armed incursions from Afghanistan. Medical emergencies were driven by a local genetic predisposition to heart attacks, bowel obstructions secondary to worm infestations and a 'huge amount of appendicitis'. Healthcare staff worked under curfew and he was on call around the clock for six months. 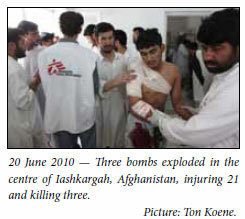 'One time we had 30 - 40 patients come in trucks, half of whom were dead, after an Afghan incursion and ensuing battle. I think what makes South African doctors so unique in humanitarian work is that we're used to violent trauma in war-like zones. Just take Hanover Park (on the Cape Flats) on a Saturday or Guguletu Day Hospital's alcohol-fuelled weekend casualties,' he said. MSF volunteers are given intensive premission briefings which include how to deal with kidnap scenarios and how to cope with the often intense psychological pressures. Asked why he kept choosing to work in harsh, remote and dangerous environments (he went from Pakistan to Tripoli in Libya for MSF three days after the anti-Gaddafi forces entered the capital), he responded: 'You see the results of what you do so much more closely and you get to feel a bit closer to being a good person by helping those worse off than you. It makes you appreciate a lot of things about your life, though it's basically selfish; you fix yourself while trying to fix others,' he grins.